Even if you didn’t own any of the 37 million pieces of baggage which went missing in air transit last year, you’ll be delighted to discover that the agony and anxiety of lost luggage can become a thing of the past if you secure your bags and cases with the new TRACE ME luggage tracker system when you travel this year. Unique registration and recovery service www.tracemeluggagetracker.com now provides a solution to lost luggage in the shape of a strong, durable tag for any bag or case with an individual serial number and 2D bar code linked for life to registration details on a secure data storage system used by more than 40 law enforcement agencies, airport baggage handling organisations and major lost property services across the globe to return lost luggage. 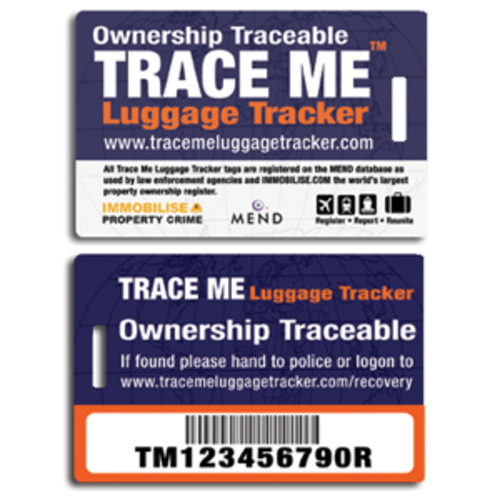 The tough TRACE ME tag provides baggage handlers and lost luggage officials at airlines, train operators, the police and local transport companies with the facility to identify your luggage and immediately notify you how to retrieve it from anywhere in the world for just £12.50 for life. Right now airline baggage handlers place a paper tag on your luggage when you check in, which is only designed to match your suitcase to your flight details. In the millions of cases when that paper tag is lost or damaged, the luggage becomes untraceable and much of it ends up at auction. “TRACE ME tags are durable and provide the owners of bags and cases with the most secure means available of identifying their ownership by linking your luggage to details on a secure server that will notify you by text message to your mobile phone and email when your missing bags turn up in the lost luggage section of any airport,” Crosland said. 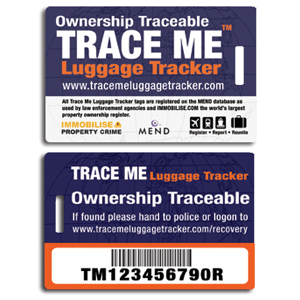 The TRACE ME luggage system is part of the Mobile Equipment National Database (MEND), which holds billions of items of discrete information relating to property ownership and is operated by the secure data firm Immobilise. Data stored on MEND comes from a myriad of sources including law enforcement and government organisations from over 40 countries worldwide. Immobilise has, over the past three years, established an impressive track record of working with the police and lost property authorities in re-uniting owners with their property and has over 20 million users. Any new TRACE ME customer simply attaches the robust tag to his case or bag with the virtually indestructible loop fob and then follows the instructions for registering their details with us on the www.immobilise.com database. More than 17 million people and 43 UK law enforcement agencies already use the completely secure immobilise system to track lost property like mobile phones, car keys, jewellery and bicycles. When the airline paper tag system fails and your bag is lost, baggage handlers are obligated to look for a means of identifying a case, but are almost always limited to a physical description. “With millions of pieces of luggage working their way through the system at London airports alone, you can imagine how many thousands of identical black suitcases with wheels that means?” Crosland said. Once an authorised baggage handler or other lost property official finds your bag, he or she simply scans your TRACE ME tag or logs onto the system via the internet and types in your unique registration number to identify you as the owner of your bag. “Once the TRACE ME server is notified that your bag has been found it automatically generates a text message to your mobile phone and an email informing you that your bag has been traced in real time,” Crosland said. The authorised baggage handler or lost property official will then be swiftly directed to contact you via the details supplied by you on the TRACE ME server to tell you how you can collect your luggage. When you write your personal details on your case, you expose yourself to identity theft, you tell unscrupulous thieves that you are on vacation and that your home may be ripe for burgling. With TRACE ME your personal details are hidden to all except those who can reunite you with your belongings. This press release was distributed by ResponseSource Press Release Wire on behalf of Trace Me LuggageTracker in the following categories: Men's Interest, Women's Interest & Beauty, Travel, Transport & Logistics, for more information visit https://pressreleasewire.responsesource.com/about.